I talk a lot about LinkedIn and Twitter these days and have for awhile. One reason because they are two of my favorite platforms in regards to democracy, the easy ability to grow a following, and the reach they can provide you as a business owner. I realize though that some businesses are firmly ensconced on Facebook because that is where they find their fans. Or maybe because Facebook is familiar and comfortable to them, and that’s not a bad reason either. 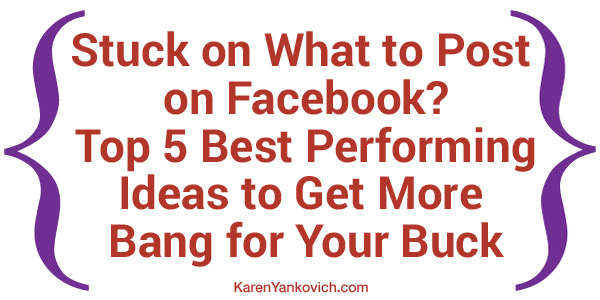 So I wanted to pay attention to all my Facebook users out there today in this blog post. I bet this number is not enough. The school of thought for Facebook posting frequency is about 4-6 times a day. The more the better, because this helps to get around the Facebook algorithm that reduces page views to non-promoted posts. So how do you come up with enough ideas to create that many posts? How to come up with enough ideas to create enough posts on Facebook. Good question. Today I’m going to help you! 1. One of my biggest pieces of advice that I give my clients and my friends when talking about what to post on social media is: always always always post about other local and online businesses. You can never post too much good stuff about the other businesses that you frequent or run across online. Why? Well first off because this type of posting is easy to integrate into your daily routine. Jot down a few notes before you leave their biz, or directly post to social media from their website. Do you like their business because of convenience? Did a certain employee go out of their way for you? Do they always have what you are looking for? Is their brand appealing to you? Does their business “why” stand out to you? Second because typically these businesses will share the love back. Finding partnerships and making alliances in your business niche, and outside of it, are key to winning the “war” of visibility online. What would be the message you would want to relate to your clients or fans in regards to this business or experience? 2. Second, write a goal oriented post. You must have a goal for every post. Ask yourself, what is it that you want to achieve here? For Facebook this answer can matter even more because this platform is a bit more informal and you want to make sure you hit all spectrums of “types” of posts. Sometimes you want to have fun, make people laugh and engage with you. Other times you want to educate about your product or service or ways you can increase the quality of life for your customers. And some posts are going to be about your business “why” with a call to action to buy. 3. Third, write a behind-the-scenes post. One of the best performing Facebook posts seems to be one that allows your followers a peak behind the scenes into your daily routine. of you on vacation reminding followers of what they can achieve if they follow your advice. of you and your team working hard to bring a project to life. about how you get motivated and stay motivated in your day to day business. Once people start to comment be sure you are ready to respond and engage. I still believe people on Facebook are looking to see that you read their comment and acknowledge it. Whether with a simple like, or with a short comment back, or with a comment and a tag mention, any way you decide to go is fine just try not to leave them hanging. 4. Fourth, use Facebook for research. This valuable method is one I definitely like to use Facebook for. Simply asking a question can lead to many interesting results and valuable information that you can use later in blog posts, web copy, or even in product creation. 5. Finally, when in doubt use a fun prompt to get the juices flowing! I use this particular resource here and highly recommend it! I love the prompts and the ideas throughout this hefty resource, you can get a prompt and post idea for every day of the year! Often if you just tweak the perspective, you can use the same prompt in a different way as well too. There is so much value in here so give this product a try, you can sign up to get one full week FREE too before you buy. For additional help, advice, and to belong to a group of people ready to cheer you on (and like your post) join me in my LinkedIn group! Don’t wait, join today, we would love to see what you have to share. Great post! I am definitely sharing! Karen, now I am really confused! I have been struggling with Facebook a bit and as a result, did quite a bit of research lately to help guide our social media person on these efforts. Almost every article I read recently (all from 2015) say not to post to Facebook more than once, twice a day at the most. We have cut back as a result. I do recognize that the industry can also have a determining factor in this, but this is the first I am seeing a suggestion of this many time a day to that platform. Thanks for addressing frequency of posting on Facebook Karen! I’d been wondering about that and thought once per day was pushing it.